The Urban Estate homes in Stapleton are the premier residences within the neighborhood. With their distinctive elegance and size, these Urban Estate homes can be distinguished by their large lot size, views and prime locations next to a park or greenway. They include 3 car garages and large open floorplans starting around 3,500 square feet above ground with prices starting in the $800’s going up to just over $1M. There are 6 builders who built Urban Estate homes in the Stapleton Community: Austin Signature Homes, Decherd Custom Homes, Harvard Communities, Latsis Custom Homes, NuWest Custom Homes and Touchstone Homes. Forest City, the master developer of Stapleton, required these builders to build traditional style homes that you would find in some of Denver’s oldest and more prestigious neighborhoods which includes Bonnie Brae, Wash Park, Country Club. You will find a variety of architectural styles ranging from Tudors to Spanish Revival to Victorians to Denver Squares, yet each home is unique in its own way. These builders showcased their best homes in the 2003 Parade of Homes along 24th Avenue, which today are still the most tricked out homes in all of Stapleton. While all of the Urban Estate lots have been sold with the exception of two, meaning there is no new construction homes for sale, there are Urban Estate resales that might be available. I am an Urban Estate expert and sell many of the re-sale Urban Estate homes in the Stapleton neighborhood. Austin Signature Homes is one of Denver’s Premier custom home builders. Founded in 1970 by Chuck and Joanne Austin, they are a well respected luxury home builder within the Stapleton community. They built about 15 homes in the neighborhood ranging from French Country, Craftsman, Prairie (pictured) as well as Mediterranean styles. Decherd Custom Homes built about 11 homes in the Stapleton neighborhood, according to James Decherd. One of their most outstanding homes is the big white colonial home on 24th Avenue which was featured in the parade of homes. They built three different styles in the neighborhood including the Mediterranean style (pictured above), Craftsman and the Colonial home on 24th. Decherd has won many industry awards for architecture, best custom home and kitchen and master bedroom suite just to name a few. They have won numerous awards for building excellence in the Parade of Homes. Harvard Communities has been building in Denver for 15 years and since that time have gained a widespread reputation for honesty, integrity and building state-of-the-art Green Homes. Harvard Communities have built more Urban Estate homes than any other building in Stapleton, with 20 homes being built in total. Harvard Communities is known for its green and near-zero built homes and won Metro Denver’s 2008 Green Builder of the Year. They have built numerous different styles of architecture in Stapleton including Mediterranean style, Denver Squares, Contemporary and Prairie style. Latsis Custom Homes, owned by Jim and Kathryn Latsis, has a long standing reputation for quality work and attention to detail. All of the Latsis Urban Estate homes exceed E-Star Energy Performance and were inducted in to the 2003 Built Green Hall of Fame for the energy performance of their 2003 Parade Home, which is seen above. Their homes in Stapleton include the Mediterranean style, Richardson Romanesque and Craftsman. Touchstone Homes have been building distinctive homes in Denver since 1974 and is a leader in innovative use of space, masterful craftsmanship and meticulous site planning. 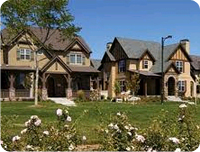 They built the grand Victorian on 24th Avenue which was showcased in the 2003 Parade of Homes, which won Best in Show. They have built many different types of architecture from the Nantucket style home (pictured above) to Victorians to Mediterranean style homes. They also built the Brownstones at Central Park which brought the look and feel of NY to our own Stapleton neighborhood.